The San Saba County Courthouse (1911) in San Saba, Texas, is a well-preserved and intact brick, stucco and sandstone Classical Revival building. The courthouse has an area of approximately 21,000 square feet, equally distributed on the first three floors, with a smaller balcony level on the fourth floor plus an attic space. Exterior walls are pressed-face brick, with rusticated sandstone quoins, lintels and sills, and stucco belt courses and spandrel accents. Three-story classical columns are stucco over concrete. Interior materials include floor finishes of concrete, wood and ceramic tile, as well as wood doors, railings and posts. The courthouse is an intact example of the Classical Revival design applied to a small county courthouse. 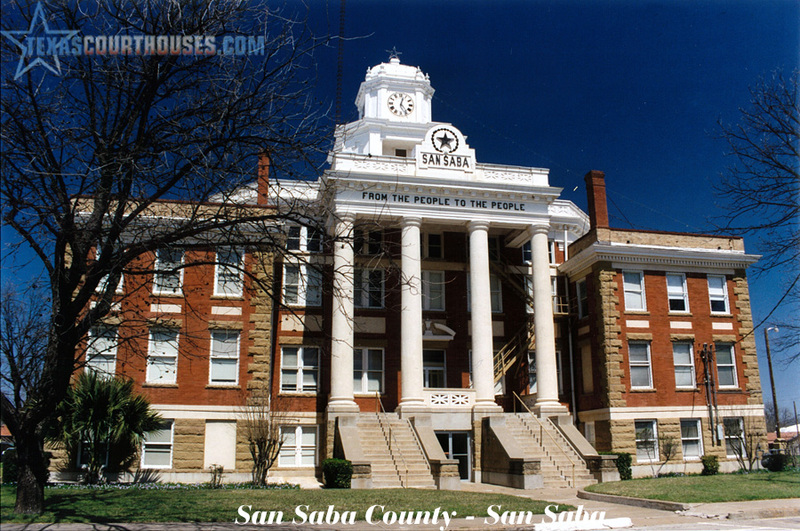 San Saba, the county seat of San Saba County, is at the intersection of US Highway 190 and State Highway 16, just south of the San Saba River and nine miles west of the Colorado River in the east-central part of the county. The courthouse is located on a rise four blocks west of Mill Creek, which flows northward into the San Saba River. The courthouse square is surrounded on all sides by commercial and civic buildings, including a county annex which houses records and the tax assessor’s office. The Burden Hotel, one of San Saba’s oldest buildings dating from 1857, is on the west side of the courthouse square. The county jail, designed in 1884 by Jasper N. Preston, is San Saba’s oldest public building and is two blocks east of the courthouse. Wallace, Live Oak, Commerce and Cherokee Streets bound the courthouse square, in the east-central section of the original town plat of San Saba. The grade generally slopes down from the courthouse in all directions, although a sidewalk surrounding the building is at lower grade than the lawn. The courthouse square is also lined with pecan trees. The sidewalks and trees represent early landscaping, dating from 1911 to about 1929. The courthouse square is surrounded by head-in parking, and the building is accessible from all four sides. There are no other buildings on the courthouse square. Historical markers and a town marquee are on the north side of the courthouse. Landscaping in the fall of 1911 included the construction of “cement walks” and the removal “from the Court House yard such trees as may be selected by the Court”. This may have included some or all of the honey locusts planted in 1881 by Edmond E. Risien, an agricultural pioneer who ran a water works and mill about five blocks east of the courthouse. Water tanks from the previous courthouse were also retained for a time, as the court purchased two female and one male goldfish to stock the west tank. Another significant change with the 1911 courthouse was the extension of the courthouse yard to occupy the full block. The previous courthouse yard occupied less space to allow wider surrounding streets. In 1922, probably in honor of the growing pecan industry, the commissioners authorized W.J. Millican to plant pecan trees on the square, at no charge to the county. Pecans continued to be a favored tree in 1929, when the square was leveled and all trees except pecans and live oaks were removed. At the same time, more pecan trees were added to the square, and sidewalks were added around the square. Electric street lamps were installed at each sidewalk entrance to the courthouse in 1930. An early iron fence was removed by 1921. The building is symmetrical about both axes, and is longer along the east-west axis. The north and south elevations each feature a central section that is four stories high and five bays across, with articulated three-story wings with three bays each. Both north and south entrances are fronted with pedimented entry porticos accessed by paired staircases. The pediments are adorned with lone stars and wreaths, the name of the county, and the motto, “From the People to the People” in the friezes. A broken arch pediment with decorative urn tops each entry door. The east and west elevations feature a central section with four engaged stucco columns flanked by three-bay sections on either side. Pressed metal awnings shelter the east and west entrance doors. Another prominent building feature is the dominant clock tower. The wood-framed tower is easily one of the tallest points in the area and exhibits one of its working clock faces in each of the four cardinal directions. The porticos originally featured four Ionic columns extending from the stairs to the pediment on the fourth level. The columns were changed to Doric style by the 1930s for unknown reasons, but are scheduled to be restored as part of the Texas Historic Courthouse Preservation Program of the Texas Historical Commission. Missing cupola elements such as parapet, finials, and columns are also scheduled to be restored through this program. The exterior is faced with red pressed-face brick, described as “Press Face, Grade No. 1, shade 3” from the Coffeyville Brick and Tile Company of Coffeyville, Kansas. Ground floor and corner quoins are rusticated soft sandstone, which is a locally quarried product. Belt courses, columns and spandrel accents are buff-colored stucco. Most double-hung hollow metal windows remain intact, although a few aluminum replacements were installed. Original wooden entry doors were replaced with aluminum storefront types in 1973. The ground floor interior of the courthouse is organized along long and short axes. The short axis is the main entry corridor and extends north and south. The original stairways are located on the south side at both ends of the east-west axis. Originally, as today, both axes terminated in doorways so that all four facades contained an entry. The second floor is organized in much the same manner as the ground floor. The difference is that the only entry points are located on the north and south. As a result, the ends of the long, east-west axis terminate in office spaces. The District Courtroom dominates the third floor. Located directly in the center of the courthouse, the courtroom divides the building in half. Short north-south corridors run beside the courtroom on the east and west sides. At this level, the staircase becomes part of the courtroom, allowing access to the balcony level above. The District Courtroom, courtroom balcony and anterooms, and the County Historic Commission room retain the original wood flooring. The second and third floor corridors are finished with a hexagonal ceramic tile. Much of the original millwork, doors, hardware, light fixtures, furniture, and stairway railings and posts have survived. Missing elements are scheduled to be replaced during an upcoming restoration. Original San Saba Courthouse materials have remained in a good state of preservation for many years. The masonry and mortar is in a good state of repair, and the exterior retains its essential character-defining features. Significant exterior changes include conversion of the Ionic pediment columns to Doric, and removal of columns and pediment from the clock tower, with these changes taking place before 1940. There were also relatively frequent repairs to the roof and clock. Some windows on the east and west elevations were covered as larger spaces were subdivided for offices. A fire escape was added to the south wall of the courthouse in 1924. In 1929, the commissioners contracted with J.W. Patterson to place a brick cornice on the roof for $760, and also received bids to install a sprinkling system on the Court House lawn. Alterations to original materials and spaces were more extensive. As original offices were subdivided and changed, floor materials were also changed at times, such as in the Farm Security Administration Office in 1943 and in the surveyor’s office and ladies’ lounge in 1947. The courthouse was rewired for electricity in 1952. Suspended ceilings were added in 1971. The exterior doors were changed to aluminum in 1973. That same year, the ground floor hallway and both stairways were carpeted. An elevator and removal of architectural barriers were addressed in 1986. One corner of the county courtroom was partitioned for storage in 1988. 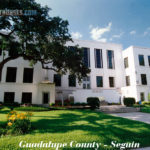 County courthouses are the preeminent building type associated with local government in Texas, and are often the most prominent and architecturally sophisticated buildings of the counties in which they stand. The San Saba County Courthouse (1911) in San Saba, Texas, stands as both an outstanding architectural achievement and the seat of county government. The building meets criterion A, in the area of Government at the local level of significance, as the continued center of county government since 1911. The courthouse also qualifies under Criterion C, in the area of Architecture, at the local level, as an excellent example of a Classical Revival public building by Walter W. Chamberlin, a designer of more than two dozen extant courthouses in the southern United States. San Saba County is located in West Central Texas, surrounded by Brown, Mills, Lampasas, Burnet, Llano, Mason and McCulloch Counties. San Saba, the largest town and county seat, is 90 miles northwest of Austin. San Saba County was created in 1856 as one of several new counties carved from the giant Bexar Land District. Its earliest historic-era inhabitants were nomadic Native Americans, specifically Tonkawas, Apaches, Lipan Apaches, and Comanches. Although a portion of the county was included in one of Stephen F. Austin’s colonization grants, permanent settlement did not occur until about 1854 when the Harkey and Matsler families settled along several area creeks. The population grew sufficiently to establish the county in February 1856. The county’s boundaries were was set at that time and have not changed. The county was named for the San Saba River that runs through the county from southwest to northeast. An election for county seat and officers was held in May of 1856, and voters selected “Rowe’s land on the hill near J.C. Rainey’s old home place” by a large margin. That election, however, was set aside, and another poll was taken in July. On the ballot at that time were Rowe’s land, Simpson Creek, and a site at today’s San Saba. Receiving 63 votes, San Saba took the election, and the town was laid out on 100 acres donated by R.D. McAnelly and Commissioner Shorty Brown. The first commissioners’ courts met in various homes in the county until a courthouse could be constructed. Convening on October 10, 1856, the court authorized the construction of a courthouse to be completed by April. Commissioners also named several committees to examine the various roads in the county. Money for the operation of county government, road construction and maintenance, and the new courthouse was to come from the county tax (half of the state levy) and the sale of San Saba town lots. By October, 68 lots had been sold for a total of $2114.05. In October the new county commissioners’ court contracted with local resident Matthew Hubbert to construct a courthouse for $850. Construction was to be completed by April 1, 1857, and funds for the building were the first to be appropriated from the county treasury. Hubbert, identified by San Saba historian Alma Ward Hamrick as “trail-blazing,…venturesome and dependable,” left Williamson County in 1855 to find better opportunities on the Texas frontier. A native of Alabama, he and his family had lived in Mississippi before relocating to Texas. A freighter, Hubbert settled on Simpson Creek and built a home just east of today’s San Saba. Known to the commissioners’ court because he had helped survey the new county seat, Hubbert was selected to build the new courthouse. Hubbert hauled lumber from Bastrop and perhaps Brenham in 1856 and 1857 for the building. Hubbert continued his freighting business after building the courthouse and was not a major builder in San Saba County. His sons followed him in the business, traveling to Bastrop, Austin, Brenham and Port Lavaca. After the Civil War, Hubbert and one son took a herd of cattle across the Pecos River into New Mexico, where they established a ranch. His wife and young children joined him there in the early 1870s, and the family later moved to California. While in San Saba County, the Hubbert home was noted for its hospitality, hosting district judges on the circuit, as well as camp meetings. This first courthouse was a frame structure completed in August 1857, almost five months after the contracted completion date. The second floor of the building was given to the Free Masons, and the building was also used as a school. Little else is known about the building, except that it evidently sat in the center of today’s courthouse square. Early San Saba was a primitive place. W. Irving Hubbert, son of the 1857 courthouse builder, remembered that when he first saw it “only three or four wooden shacks composed the town; stakes ran in each direction.” By 1857 a post office had been established, and in 1860 the town had 111 inhabitants. San Saba County had grown to 913 people, 89 of whom were slaves. During the short antebellum period the economy was based on cattle raising and subsistence agriculture. San Saba County citizens supported states’ rights and the Confederacy, although there were relatively few slaves in the jurisdiction. Native son Col. James E. McCord’s Confederate Regiment was headquartered at Camp San Saba in adjoining McCulloch County and primarily saw frontier duty during the war. After the Civil War, San Saba County continued to grow, increasing to more than 1,400 inhabitants in 1870, 168 of them living in the county seat. San Saba was the only town listed in San Saba County in the census of 1870. During the 1870s, county population increased almost fourfold to more than 5,300. Agriculture continued to be the mainstay of the economy with cattle, sheep, goats, and cotton being major commodities. The town of San Saba continued to grow during the last quarter of the nineteenth century, serving the surrounding agricultural community. In 1873 the San Saba News was established, said to be the first newspaper in western Texas. By 1880 the town had more than 1,200 inhabitants, a bank, two newspapers, and several grain mills and cotton gins. After a storm damaged the first courthouse, the remains of the structure were sold to James F. Brown for demolition and the second courthouse was built. The new two-story stone building, situated in the center of the courthouse square, was square with slightly protruding entrances on all four sides. A central frame cupola surmounted the metal roof. The court accepted the new building about February 1878. In early 1879 the county passed a “special Court house and jail Tax of one fourth of one per cent” in order to pay for the new building and to repair the jail. Like the first courthouse, the second also served as the headquarters for the town’s social life. The commissioners gave the San Saba Brass Band permission to practice and give concerts in the courtroom, in exchange for the band installing and maintaining “basket lights.” In May of 1881 “teachers of vocal music and their class” were given permission to practice and hold concerts in the courtroom, if proceeds went “to benevolent purposes.” A “social hop” at the courthouse at the end of November, however, dissolved into a general melee. During the 1880s and 1890s San Saba County was a lawless place, and several factions within the county fought in open mob warfare. After dozens of men were killed, the Texas Rangers were dispatched to restore order by 1893. Early railroad building in West Texas bypassed San Saba County, perhaps due in part to its notoriety. However, by 1906 the Santa Fe Railroad decided to extend their tracks into San Saba County. Construction was delayed by the national panic of 1907, and the track was not started until March 1910. After a false start in May 1909, the commissioners considered building a new courthouse in the late winter of 1909. In January 1910, no doubt spurred by the coming rail line, the San Saba Chamber of Commerce put out a large mailing to 1,200 voters in the county asking their opinions about a new courthouse. According to the San Saba Star, “The returns are coming in and so far a large majority are in favor of the proposition.” At their meeting on February 19, the commissioners set an election for April 9 to consider $75,000 worth of bonds to build a new courthouse. Voters approved the bonds by a count of 653 to 526. Several architects and builders responded to the county’s solicitation to design the new courthouse, and on June 29 the commissioners looked in detail at two finalists: the firms of Churchill & White of Fort Worth, and Chamberlain and Company of Birmingham, Alabama. On the advice of local architect and builder Walter R. Smith, the court selected Walter Chamberlain’s design. Chamberlain and Company had recently designed the Deaf Smith County courthouse in Hereford in 1910, and the commissioners may have been familiar with that Classical Revival structure. According to the San Saba Star the Chamberlain Company “makes a specialty of court houses, having designed over 60 of them and have [sic] done work in ten states.” Chamberlain worked quickly, and on July 25 the commissioners accepted his plans and authorized solicitation for bids. San Saba is one of the 100 extant Texas courthouses built between 1900 and 1940 grounded in classical styles. Domes, grand columns, and pediments evoked a classical era rooted in interpretations of Roman classical styles. The Texas rendition of the style has been dubbed “Texas Renaissance” by Willard B. Robinson (1983) and “Academic Eclecticism” by Jay Henry (1993). The historic building finishes were considered modern and technologically advanced at the time. The pressed brick exterior cladding followed the courthouse trend even though locally quarried stone and wood were the materials of choice in the rest of the town, due probably to the lack of rail transport up to that time. Painted and scored plaster and woodwork defined interior finishes, and plaster and pressed metal were the ceiling materials. The second floor also included offices for the district clerk (with vault) and the county attorney, as well as rooms for the petit and grand juries, a consultation room and toilets for men and women. The commissioners awarded the building contract to Falls City Construction Company of Louisville, Kentucky on August 17, 1910. 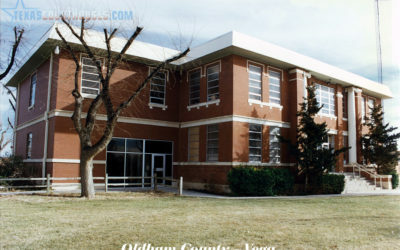 County offices moved to the Murray Building at Wallace Street fronting the square in mid-September, and removal of the old courthouse began. In February 1911 the commissioners addressed furnishings for the new building and decided “to make a visit to some modern courthouses to be better able to select the necessary furniture and inside equipments and fixtures.” While the local paper did not divulge where these “modern” courthouses were, the group selected the C. H. Meyers Company of Houston to supply wood furniture, and Mr. C. A. People of Dallas, “the Steel furniture man,” to equip the building with his specialty. Texas Sealing Company provided wood blinds, and Brown-Woods Electric Company supplied light fixtures. On August 11, 1911, the county accepted the new courthouse after a personal inspection led by the contractor and W. R. Smith, who was the supervising architect at the time. The contractor warranted portions of his work, including three months for cement work and a year for the roof. He guaranteed that the radiators “will develop sufficient heat to produce 70 degrees Fahrenheit in the several rooms where placed when the outside temperature is at 10 degrees above zero.” The heating system, however, developed problems long before the one-year warranty expired. A report to the court in January 1912 noted that the furnace in the courthouse “is not giving satisfaction, said furnace failing to produce heat sufficient to properly heat said Court House.” In addition, the boiler was leaking, and the grating was “practically burned out.” The court ordered the county judge to contact Falls City Construction Company about the warranty and repairs. During the twentieth century, San Saba County’s economy has continued to be based on its agricultural productions. Cattle, sheep, and goats are important commodities, joined by grains and pecans. The horticultural work of Edmund E. Risien, who moved to San Saba County in 1874, established pecan culture as a significant crop. Promotion of the product has led the county to dub itself the “Pecan Capital of the World.” Stone quarrying, recreation, and tourism are also significant elements in the county’s economy today. The San Saba County Courthouse meets Criterion A, in the area of Government, for its role as the center of local government in San Saba County since 1911. The courthouse also meets Criterion C, in the area of Architecture, as an excellent and well-preserved regional example of a Classical Revival style public building. Architectural features including columns, porticos, pediments, quoins, and façade symmetry are elements of the Classical Revival style. The courthouse retains integrity of location, setting, workmanship, materials, design, feeling and association to a high degree.